The fit-out is cosy and unpretentious, the owner is up for a chat and supremely knowledgeable, and most importantly, they make damn good wine. “I just want to make good interesting booze”. Livewire started off as a side project in 2012, without a physical venue. Geelong wine aficionados may be able to identify a few Livewire creations, stocking businesses like The Hot Chicken Project, Union Street Wine and Bottles and Barrels. These days, it sits nestled in a shed next to Swan Bay’s Piknik. One of their most recognisable drops is The Blood of Hipsters, a Shiraz which, as Brain so accurately describes it, is “just a very drinkable wine”. Other varieties include a savoury style sauvignon blanc and a lovely Grassy Point Chardonnay. In total, around 70 per cent of the wine production is Geelong based. Though it does have that local element, putting a label on Livewire’s winemaking style has proved a difficulty. While Livewire has produced a few natural wines, Brain definitely wouldn’t consider himself a natural winemaker as such. Nor would he consider himself a commercial winemaker for that matter either. His wine philosophy is one of “lo-fi, considered intervention,” with a strong belief that the quality of the wine all comes back to the farming. “It’s not a criticism of other makers and producers, but a lot of them are very stuck in their winemaking styles,” he says. “But the market has changed, the market is dynamic, people want to see different things, they want to taste different things”. Even if you don’t fancy yourself a wine drinker, the venue itself is still the perfect place to enjoy a lazy afternoon. Brain has paired the original wood panelling of the shed with timber features, including a beautiful communal table made from one of the bowling lanes of the old Northcote bowling alley. The outline of an old cemented-in mechanic’s pit, with a still functioning hydraulic jack, speaks to the shed’s past life. A fireplace is on the cards for next winter, to keep the good times rolling though the cooler months. Happily, all wines are available by the glass, and taking home a bottle won’t break the bank, with most wines priced at around the $20 to $30 mark. For this author, the Livewire Wines cellar door is set to become a weekend staple. 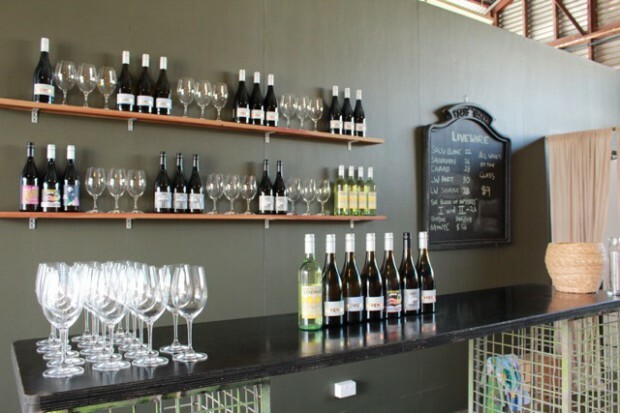 Livewire Wines cellar door is located at 1125 Queenscliff Road, Swan Bay Victoria.